Well, I broke out the wallet after finally locating a ventilation means which I was pleased with. After extensive searching and just not being happy with what is available for campers and slide-ins on the market, in regards to ventilation, I altered my searching strategy. I found the golden nuggets, and they are the ventilation fans which are made for yachts, large cabin laden boats and smaller airplanes. By the way, there are lots of nifty inventions made for watercraft and planes that have never made it over into the camper and slide-in arena. "Now, why not because you all have some extra cool stuff? Get on it!" I cannot understand why some of that stuff isn't being marketed for campers....it would work so nicely. And WILL- because here we go. 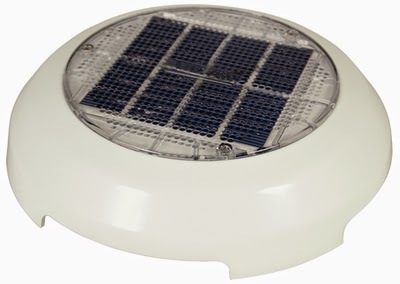 I purchased a low profile, 4" day/night solar-charged, battery-operated ventilator made by Nicro. I found it over at WingsAndWheels.com. The low profile meant I need not be concerned with a large, obtrusive, non-aesthetically pleasing cowl sitting on top of my camper battling the wind, everytime I struck out on the open road. Have you seen those atrocious 'things' on top of some of those RVs. My goodness!! The watertight design of this ventilator meant, the unit will run during every rain storm --fresh air in-rain stays out. That's what I like. Consolidate that with this fact- the 4" Nicro fans move 24,000 cubic feet of air a day. Human air exchange average is 388 cu.ft air per day. The fact that I only sleep in the camper 5-8 hours at the time would be more than ample air exchange. If a rain storm approached during those mid-morning hours and I needed to close the windows, I could. With my 1.5" intake located in the lower level of the camper and the fan in the upper front of camper, that arrangement should provide me with sufficient oxygen supply throughout the night. Yeah, I had to purchase a brand new holesaw for the purpose. I already had the arbor but not a holesaw of this magnitude. The Nida-Core cut so beautifully and the fan was mounted within minutes, thanks to the help of my lovely wife. FYI- its super nice to have someone on the inside to assist when mounting these ventilators. Although, I could have possibly done so by myself, it would have been challenging to say the least. Grab you some help, a holesaw sized to fit the fan's protrusion and some butyl tape for the underside of the top cover and you'll be in business. Your'e looking like a pro already. This unit probably weighs somewhere in the 700 pound range, considering sum of panel weights and resin/cloth used to build. 1/2 ton pickup carries just fine. I have Air-Ride brand air bags installed on the rear wheels of my 1/2 ton pickup and have no sway or any other issues when hauling. Camper shower (never used). I never have installed a water tank simply because I have not necessarily needed one. The camper is located in the eastern part of North Carolina. Where has the Nida-Core 3M Composite Panel Manufacturer gone to? It has recently come to my attention that Nida-Core 3M of Port Saint Lucie, Florida has been bought out by Composite Essential Materials. So if you have been attempting to locate Nida-Core panels directly from the Nida-Core plant you have more than likely landed on a dead end road. I am not sure if the panels are continually being made in the same plant as before, but it sounds like they are. According to Composite Essential Materials, they will be opening yet a second distribution location in Elkhart, Indiana for your 'panel location' researching needs. Please find the Industry News message below for your convenience in the event the link provided above should ever be broken. Maritsa Dan, president of startup Composite Essential Materials (CEM, Port Saint Lucie, Fla.), reports that CEM has taken over the core materials business previously known as Nida-Core/3M. 3M (St. Paul, Minn.) had acquired Nida-Core in January 2011, but subsequently decided to exit the core-manufacturing business. Dan says that Dan Family Holdings, the owner of CEM, has agreements with all of the previous Nida-Core suppliers, including NidaPlast (Thiant, France), the source of Nida-Core materials for plastic honeycombs, PGI Matline for laminating bulkers and Flexokore for balsa products. CEM also will offer polyvinyl chloride (PVC), polyurethane (PU) and polyethylene terephthalate (PET) foam core as well as glass-reinforced fiberboard. In addition, CEM will be a North American distributor of resin supplier Nord Composites (Condé Folie, France). Future plans include expansion of product offerings to honeycomb in low-, medium- and high-densities as well as fire-retardant versions, plus honeycomb designed for use in infusion and resin transfer molding (RTM) processes. Resin products to come include tooling resins, skinning material, transom putty and sprayable print-blocking core. A second distribution site will be established in Elkhart, Ind., where CEM will produce large pultruded panels with several options for core and fiber-reinforced plastic surfaces. Dan says previous and new customers are welcome to call Maritsa Dan at (772) 342-4991 or e-mail mdan@composite-essentials-llc.com. Weight of the Camper after it was all said and done. I had a recent inquiry to the overall dry weight of the camper. From my calculations and experience in loading the camper I would say somewhere in the ballpark of 600-700 pounds. I did not keep tabs on the weights of all inputs during the build. That would have been nice but there was enough detail to have to worry about in other realms so the calculations simply fell through the cracks. I do know that the entire collection of sheetgoods (Nida-Core) weigh in at 32 pounds per and I had 10, minus the small segments leftover that were thrown away. Would have been 11 but ended up settling for a piece of 3/4" plywood- epoxied saturated and painted- for the backwall. I have never had a chance just yet, to actually obtain my truck total weight on a set of scales since the camper has been added. But I really feel good about the guesstimate projection. When it came time to choose what water heater system to use in the camper I quickly realized the shortage of choices. I would have loved to have installed an in-demand unit remotely but simply did not have the remaining monies at this point in the build. Plus, I really did not have the space to mount one anyway, after making appropriate arrangements for a larger water tank. I guess I could have mounted one on the exterior wall adjacent to the sink I suppose but the cost was the limiting factor. I had seen an 'in-use water heater shower head' years ago and began a search for a reputable supplier. I ended up landing on the Marey Heater Corporation site, this firm is located in Peurto Rico and offers the 120 VAC in-use water heater, shower head. I was a bit concerned having such an arrangement- wet environment, powered unit in the shower- but there appears to be safeguards (insulated housing). I plan on installing a ground fault circuit interrupter (GFCI) on this circuit. One should never have any type of electrical install that serves a wet area (sink, countertop, exterior app) without one. Matter of factly it is a National Electrical Code mandate across US....well yeah- 'national- US..duh!'--lol. A 30A GFCI circuit breaker will suffice. I understand these units are commonly used all throughout Peurto Rico, various parts of Mexico and perhaps other portions of Central America within their dwellings and commercial buildings. My plumbing was certainly not the neatest install, but functional. I have a switch for the shower head and another switch for the water pump. I can turn the power off to the shower head before I disengage the pump, thus preventing a dry element incident. The piece of angle the shower head is mounted to is for rigidity while in transit because the shower head is forward heavy. The surface mounted plumbing allows me to remove the unit should it ever need replacing. Was not enough room in my wall studs for the fitting arrangement and it was O'dark-30 when I was working on this, no stores open and I needed this baby in. Anyway it's not a photo booth, just an area to wash after a day of field research. I have been gone from the blog world for quite sometime. Just had some extra time to provide a walk through of the camper interior. Mind you- it is a work in progress, still needing a water tank. I had a water tank purchased already but it is a long story as to why it is not in use. As you can see in the picture below there is an electrical junction box mounted between the wall studs. This box is for the service of the 120 VAC instantaneous hot water showerhead. Also above that is the switch that runs the 12 VDC waterpump. This allows me to turn off the waterheater electrical supply just prior to turning off the pump to ensure I do not have a dry element and ruin the showerhead. Risky facets I agree...but options are very limited in North America when it comes to 'hot water heaters for campers' unless you want to take up a lot of space, spend a boat load of money and then whine about how much you just spent. This particular unit I installed - Marey Tankless point-of-use, water heater showerhead- is not even offered on the home range, these come from Peurto Rico. It will be served by a 30A Ground Fault Circuit Interrupter breaker in the panel. I know, not the most aesthetically pleasing setup. I'll be the first to shake my head in agreement with you...it's called running out of money at this point in the build. But there is a method to the madness- the different colored switches will actually empower me to distinguish between the pump and the shower head supply. "A Contraption"- but it will serve to wash the stink off and prepare the old boy for the sack. A peek underneath the sink shows where the incoming water line will be connected and the sink drain/vent. I searched a little across the web and ended up going with the decision to purchase Air Lift Ride Control Air Springs, Air Lift 59501 Ride Control Air Bags specifically, to install on my truck to aid in better handling with the camper on the truck. I have a friend of mine that has a set on his vehicle and had nothing but good things to say about the bags. He had never had a rupture or any issues with them after hauling cargo and weight continuously throughout the years So this extra push, overcame that inertia and I bit the bullet and spent the little sum of money. I was a bit concerned with having sufficient wheel clearance between the back sides of my tires and the air bags when inflated after reading some of the reviews about the bags that are posted online. I believe most of those individuals have larger than factory type, off road tires. Although, I have a hybrdized off road tire on my truck they are not as wide as some of the one's specifically geared towards offroading are. I was able to install the bags on my truck and even after inflating them still have ample space between the two. I spent the better part of 6-8 hours one evening to take both rear truck tires off and to install the springs. Ended up calling a good friend so that I could utilize his concrete driveway to do so. Was not about to execute this feat on grass lawn. The proper mounting of the brackets come with a handy dandy little device in the kit, that allow you to properly align the two bracket halves alongside the chassis where they are to be mounted, so you can obtain location specific marks for drilling. Then I had to drill some holes in the chassis...newly purchased, sharp HSS bit made this go smoothly. Overall, the install was not difficult. Routed a little bit plastic air hose to the rear of vehicle (supplied in kit) where I mounted my valve stems in the bumper near the registration plate mounting area and I was in business. It only takes a small bicycle tire handpump to maintain these bags. I am able to keep them taut with only minimal air pressure. I am impressed with the ease of operation in inflating these...they really work well. I have not had any issues with loss of air from the bags and they have been on over a year now. This was one of the better decisions that I made, to go with this purchase and install. Not sure what it would have driven like without these air springs but the truck drives and handles superbly with these installed. I must say I'm Impressed! Content and photos are sole property of the author. No copy without permission.. Simple theme. Powered by Blogger.